Some will have to explain to God what they did and why. AFATHER struggles to raise his children in “the training and admonition of the Lord” (Eph.6:4). He wants them to respect God and lead godly lives. He tries to instill faith and guard their moral purity. But at work against him are devastating enemies. Five days a week he delivers his children to school. Once upon a time —back in olden days— school was a parent’s helper, but now this father may deliver his children to a teacher who smokes like a chimney, drinks like a fish, talks like a sailor, lives like a pagan, and dresses to embarrass a prostitute. Evolution is promoted, but prayer and Bible are outlawed. Courtesy is ignored. Money and things are the only values. Spiritual training is under attack every day. Is it possible this father win against such an enemy? . Peer pressure from worldly kids is the real attack. They push his kids to dress like others –even when it is improper. They pressure them to use coarse, vulgar speech. His kids are urged to go where others go and do what others do. “Everyone is doing it” and “everybody will be there” is not rational but it is hard to successfully answer. The brother has his work cut out for him. A father expects nothing else of the world, but worse –more damaging –more disheartening are “Christian’s kids. They go where they should not and do what the Bible clearly forbids. In most ways they are as ungodly as the worldly kids at school —except their ridicule is harder to take. This father’s kids are nerds at church and outsiders at school. What an obstacle! This father needs all the help he can get! What about his church friends –his brethren? His struggle is ignored —at best. They do not hold up his hands —offer no encouragement. Rather they criticize his best efforts. “Too strict” No one works with his kids to do right. “Daddy, even at church, nobody agrees with you” complain his kids. But they think, “Daddy is a nut!” And brethren confirm the conclusion. All too often, brethren are a major part of the problem and no part at all of the solution. Someone will have to explain to God why they helped defeat a father fighting for the purity of his children —- why they discouraged these young people from doing right —- why they contributed to the downfall of these little ones among us. 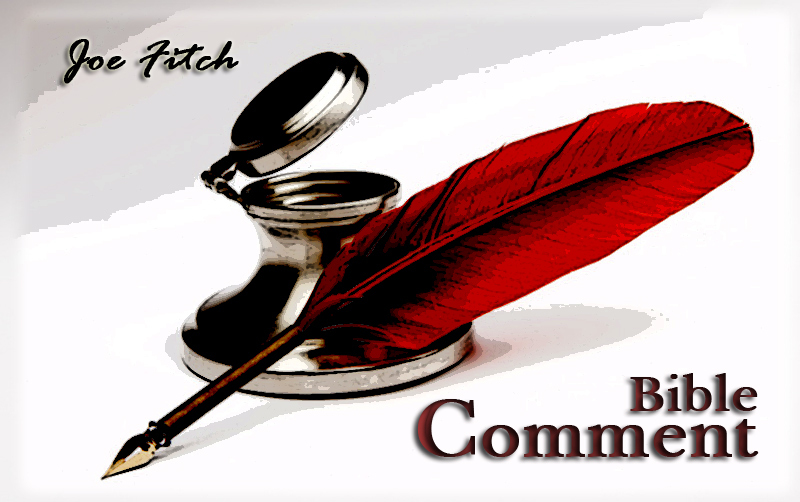 Bible Comments, 7, a publication by Joe Fitch originally intended for distribution among small congregations in Texas.